Lucy Rumsey Holt’s photographs chronicle one family’s experience in the north woods of Wisconsin over nearly forty years, starting in 1898. Holt’s photographs reflect a sense of place, most notably the Island on Archibald Lake, near Lakewood in Oconto County, WI. As a Presbyterian, Holt was a woman of character. While a model of rectitude, she had sense of humor, which comes through in her style of photography. Born in 1870, Lucy Rumsey grew up in Chicago, Illinois. In 1890, she graduated from Ferry Hall Seminary, which offered a liberal arts curriculum for women. Five years later, in 1895, she married William Arthur (W.A.) Holt and moved to Wisconsin. W.A. and Lucy Holt lived the rest of their lives in Oconto, WI, where W.A. Holt enjoyed a successful career with the Holt Lumber Company. Lucy and W.A. Holt had four children: Jeannette, Alfred, Eleanor, and Donald. The Holt family spent their summers at Archibald Lake, near Lakewood in Oconto County. Between 1898 and 1936, Lucy Rumsey Holt photographed family, friends, and household employees. 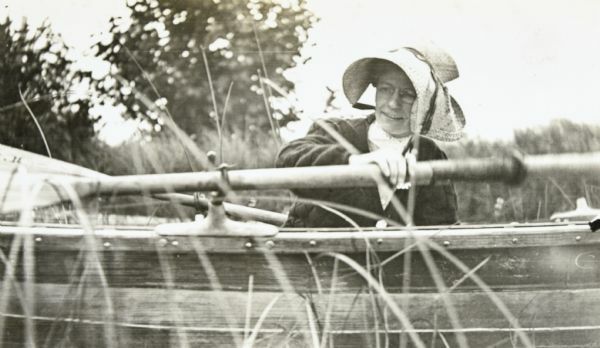 Due to advances in mobile photography, Holt was able to take photos while berry picking, hiking, and rowing. She used small portable black and white film cameras. In January 1938, Lucy Rumsey Holt passed away. She was eulogized as a community leader. Holt is buried in the cemetery at the First Presbyterian Church in Lake Forest, Illinois. The setting for many of Holt’s photographs is a 5-acre wooded island in secluded Archibald Lake in Oconto County. Completed in 1898, the Holts’ vacation home on the Island was a log cabin, with a large stone fireplace. Cooking and eating were in one area and sleeping in another area, separated by an open-air midway. This floor plan, resembling a lumber camp, was not entirely surprising given W.A. Holt’s career in the lumber business. This home was built by the lumberjacks working for Holt Lumber Company. W.A. Holt named the summer home: the Island. 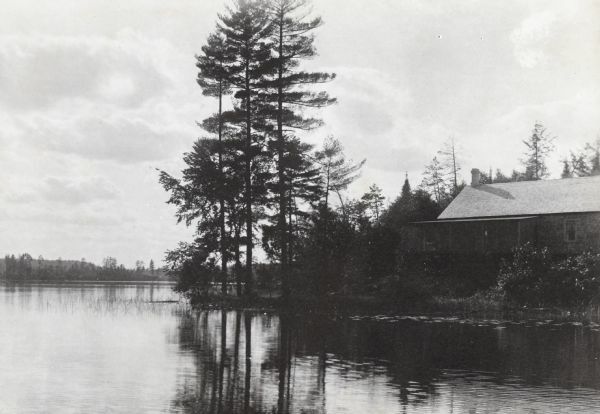 Unlike some of the other gathering places in northern Wisconsin in the late 19th century, Island Lodge did not start as a men’s hunting and fishing club. Lucy Rumsey Holt set the tone of decorum, hospitality and temperance at Island Lodge and because of this, women and children were always welcome at Island Lodge. Each year, starting in mid-July, the Holt family vacationed for eight weeks on Island Lodge. Adults and children spent most of their days having fun outdoors. 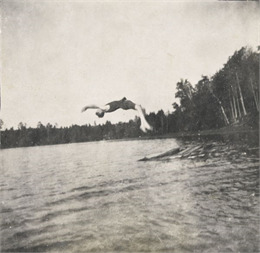 Holt photographed sports and leisure activities including: baseball, berry picking, canoeing, clam digging, diving, fishing, harvesting grapes, hiking, horseback riding, kayaking, rowing, playing with toys, shooting, swimming, tennis, and tetherball. She also documented campfires, picnics, and dramatic plays. Like many women of her day, Holt managed the household. Holt ran Island Lodge in an orderly and disciplined manner. Meals were served at scheduled times, with family and guests summoned from their activities by a bell. Quiet time after lunch was strictly enforced. And only about an hour, each day, was allotted to being in the lake. Unusual for the times, Holt photographed the people who helped her manage the household. These women and men made it possible for Lucy and W.A. Holt to invite friends and family to their lodge. 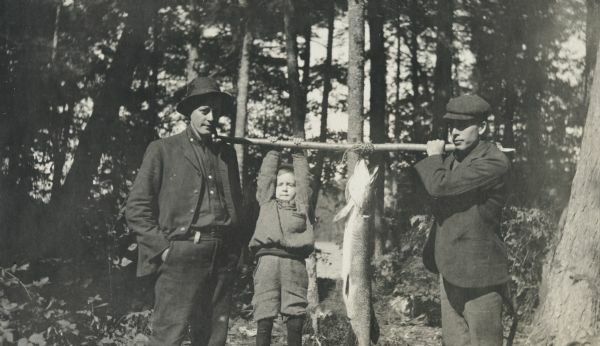 There are portraits of cooks, house cleaners, lumberjacks, and farmers in the family albums. The Lucy Rumsey Holt photographs show the importance of religion to the Holt family. Holt was a faithful Presbyterian whether at home or on vacation. On Sundays, Holt organized weekly church services, held on the porch at Island Lodge. She took her children for Bible readings to Cathedral Woods, an old-growth stand of white pines that Holt helped protect. She supported Presbyterian missionaries in China and other places around the world. When Presbyterian ministers came to visit, Holt took their portraits, most notably, Dr. James Gore King McClure. He was the first President of McCormick Theological Seminary in Chicago, founded by Cyrus H. McCormick. Surrounding herself with Rumsey relatives was one way that Holt kept up the connections to her family of origin. Marrying W.A. Holt did not mean surrendering her Rumsey identity. 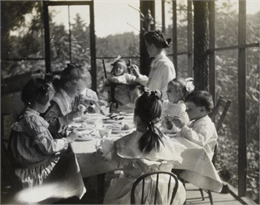 Holt brought her parents and siblings up to the cottages on Archibald Lake. Her father and Civil War captain I.P. Rumsey was a frequent guest. Siblings Juliet Rumsey Stroh, Wallace Rumsey, Henry Rumsey, and Minnie May Rumsey all appear in the photographs. W. A. Holt’s brother George Holt was the first resident at Pine Knot (then called “the Hermit”), but he died young and the cottage passed to Holt’s sister Juliet Rumsey Stroh and her husband Grant Stroh. They had four daughters: Harriet, Margaret, Elizabeth, and Juliet, all of whom were close in age to the Holt children. Elizabeth Stroh, who married Clarence Showalter, built a house on the lakeshore at Deer Point, summering there with their family. 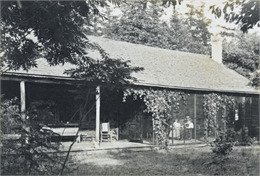 W. A. Holt established his sister Anna Holt Wheeler and her husband Arthur Dana Wheeler in the Ark, the second house on the island built in 1905. Sadly, the Wheelers died young, and Donald and Elizabeth Holt purchased the Ark. Gordon Wheeler, a treasured boyhood playmate of his cousin Donald Holt, eventually built Camel Bells, the last of the mainland cottages, directly opposite the Ark. The Holt-DeWitt family recently donated the original ten-volume set of photo albums of Lucy Rumsey Holt to the Wisconsin Historical Society. 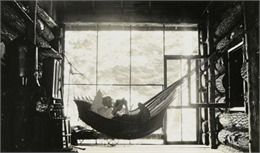 The albums, dated 1895-1936, contain photos that Holt made on the family property at Archibald Lake, in Lake Forest, Illinois, in the area around Oconto, Wisconsin, and in China. One of the ten albums is labeled “Don and Eleanor DeWitt 1930-1935”. Holt took approximately 80% of the photos in this collection. The Lucy Rumsey Holt image collection complements the Holt Lumber Company business records, preserved by the Wisconsin Historical Society at the University of Wisconsin Green Bay Area Research Center. The Oconto County Historical Society has Lucy Rumsey Holt’s electric car, her wedding dress, and other Holt family artifacts. In this short 2018 video, family members reflect on the importance of the island retreat in family memory, and the importance of preserving the historical record.